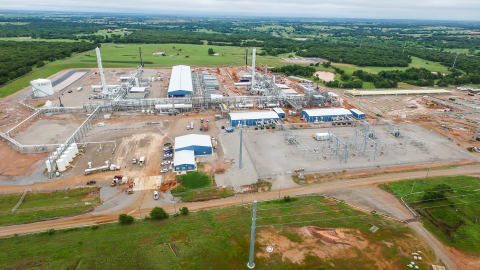 Enable Midstream Partners, LP (NYSE:ENBL) announced today that its Bradley II Plant is now fully operational. The Bradley II Plant, a 200 million cubic feet per day (MMcf/d) natural gas processing plant located at Enable’s Bradley Processing Complex in Grady County, Oklahoma, further enhances Enable’s market-leading natural gas gathering and processing capabilities in the prominent SCOOP and STACK plays in central Oklahoma. The new Bradley II Plant is a state-of-the-art cryogenic natural gas processing plant and is the ninth processing plant to be connected to Enable’s super-header processing system, a large-diameter pipeline system with the capacity to process almost 1.7 billion cubic feet per day (Bcf/d) of natural gas. Enable owns, operates and develops strategically located natural gas and crude oil infrastructure assets. Enable’s assets include approximately 12,400 miles of gathering pipelines, 14 major processing plants with approximately 2.5 billion cubic feet per day of processing capacity, approximately 7,900 miles of interstate pipelines (including Southeast Supply Header, LLC of which Enable owns 50 percent), approximately 2,200 miles of intrastate pipelines and eight storage facilities comprising 85.0 billion cubic feet of storage capacity. For more information, visit EnableMidstream.com. This press release may contain “forward-looking statements” within the meaning of the securities laws. All statements, other than statements of historical fact, regarding Enable Midstream Partners’ (“Enable”) strategy, future operations, financial position, estimated revenues, projected costs, prospects, plans and objectives of management are forward-looking statements. These statements often include the words “could,” “believe,” “anticipate,” “intend,” “estimate,” “expect,” “project,” “forecast” and similar expressions and are intended to identify forward-looking statements, although not all forward-looking statements contain such identifying words. These forward-looking statements are based on Enable’s current expectations and assumptions about future events and are based on currently available information as to the outcome and timing of future events. Enable assumes no obligation to and does not intend to update any forward-looking statements included herein. When considering forward-looking statements, which include statements regarding future commodity prices, future capital expenditures and our financial and operational outlook for 2016, among others, you should keep in mind the risk factors and other cautionary statements described under the heading “Risk Factors” and elsewhere in our SEC filings. Enable cautions you that these forward-looking statements are subject to all of the risks and uncertainties, most of which are difficult to predict and many of which are beyond its control, incident to the ownership, operation and development of natural gas and crude oil infrastructure assets. These risks include, but are not limited to, contract renewal risk, commodity price risk, environmental risks, operating risks, regulatory changes and the other risks described under “Risk Factors” and elsewhere in our SEC filings. Should one or more of these risks or uncertainties occur, or should underlying assumptions prove incorrect, Enable’s actual results and plans could differ materially from those expressed in any forward-looking statements.